With his good looks and wonderfully accented voice, Ray Milland became a popular leading man in movies during the 1930s and 40s. After bagging an Oscar for Best Actor, he held on to his craft, acting in cheapie horror films, which at the time, seemed — unseemly, but in fact was a testament to his desire to work. Milland's father was a steel mill supervisor, who had had an adventuresome career, but barely spoke of it to his young son. Educated at King's College School in Cardiff, Ray left home at the age of 21. Becoming a member of the Household Cavalry, Ray became an expert marksman. A chance meeting with American actress Estelle Brody resulted in Ray getting out of the service to concentrate on acting. Starting out as an extra in Piccadilly (released in June, 1929), his reputation with the rifle got him a part in The Informer (released in October, 1929). The director working on the next-door stage saw him and cast him in a thriller The Flying Scotsman (released in May, 1929). He took the phrase Mill lands as his stage name: Milland. Milland did a few more films, but was unsure about his technique. Touring in a production of The Woman in Room 13 for five months brought him a certain amount of experience, which led to his being offered a contract in 1930, by Metro-Goldwyn-Mayer to make pictures in Hollywood. The director of his first U.S. film, Son of India (released in August, 1931), berated him for his poor acting in front of the entire crew. Humilliated, Milland wanted out of the whole deal, but M-G-M execs talked him into staying the course. More small parts ensued, allowing Milland to meet, woo and marry Muriel Frances Weber; the two would remain married until his death. M-G-M decided to let Milland go from his contract in 1932, causing him to move back to Britain, but work was impossible to find. Leaving his wife there, Milland returned to Hollywood, doing odd jobs until he was cast as a last-minute replacement in a George Raft picture Bolero (released in February, 1934) at Paramount. Ad-libbing a scene with George Burns and Gracie Alllen in We're Not Dressing (released in April, 1934), so impressed director Norman Taurog, that Milland was put under a seven-year contract at Paramount. He was loaned out to Universal for Next Time We Love (released in January, 1936), and Three Smart Girls (released in December, 1936). The Dorothy Lamour picture The Jungle Princess (released in December, 1936), found the actress asking for Milland to be her co-star. The picture worked, and suddenly, Milland was in the ranks of leading men. They kept him busy: Bulldog Drummond Escapes (released in January, 1937), Easy Living (released in July, 1937), Hotel Imperial (released in May, 1939), Beau Geste (released in July, 1939), and Everything Happens at Night (which played the Chinese in December, 1939). He returned to Britain to appear in the film version of French Without Tears (released in April, 1940), then returned to the U.S. after Pearl Harbor; he was rejected from military service due to an accident which impared his hand. He became a flight instructor for the Army and toured with the USO in the Pacific Theatre. Paramount kept him busy meanwhile, where he starred in pictures like I Wanted Wings (released in March, 1941), Reap the Wild Wind (released in March, 1942), The Major and the Minor (released in September, 1942), and Ministry of Fear (released in December, 1944). Milland's greatest succest came in the film The Lost Weekend (released in November, 1945), with him the focus of a ground-breaking film. So ground-breaking that Paramount seriously considered shelving it, but the film was rolled out slowly; critics were wowed, and the public agreed. Milland won the Best Actor Oscar on the stage of Grauman's Chinese on Thursday, March 7, 1946. Films he did after winning the Oscar include: Golden Earrings (released in August, 1947), The Big Clock (released in April, 1948), Close to My Heart (released in October, 1951), The Thief (which played the Chinese in October, 1952), and Dial M for Murder (released in May, 1954). 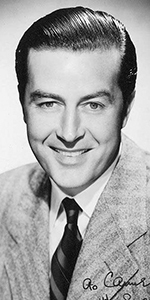 Television bekoned, and Milland answered the call by playing Professor Ray McNulty in The Ray Milland Show on CBS from 1953 to 1955. While working in television, Milland went into directing, helming and starring in a western, A Man Alone (released in October, 1955), and Lisbon (released in August, 1956). He also directed television shows such as Schlitz Playhouse in 1957, Suspicion in 1958, and episodes of General Electric Theatre in 1956-1958. Milland the voice of Satan in the remake of King of Kings (released in October, 1961), and starred in and directed Panic in the Year Zero! (released in July, 1962), and played the title role in X: The Man with the X-Ray Eyes (released in July, 1963). He starred and directed Hostile Witness (released in November, 1968) and Love Story (released in December, 1970). Milland published his autobiography, Wide-Eyed in Babylon in 1974. Milland did a lot of television, guest starring on shows like The Name of the Game, Night Gallery, Columbo, Ellery Queen, Rich Man,Poor Man, Battlestar Galactica, Fantasy Island, The Love Boat, etc, etc, etc. He was busy right up to the end.Milland died of lung cancer in 1986 at the age of 79. Grauman's Chinese Theatre, Hollywood, California. Ray Milland Forecourt ceremony, Thursday, April 17, 1947. 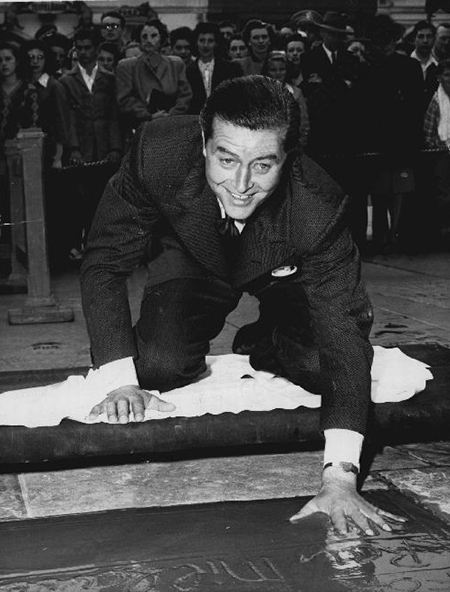 Ray Milland gives out a happy smile as he places his handprint into the cement.